It is estimated that over 50% of homes in the US have some form of mold damage. With so many people living in homes that have been damaged by mold, it is important to take a look into the possible health issues that mold exposure can cause. While the health issues from mold exposure typically don't hit the mainstream media, it is becoming more known that mold can wreak havoc on people's health. Dr. Ritchie Shoemaker has been one of the biggest influencers in the research done on mold toxicity and how it has impacted the health of families, school district employees, and even large companies. In his books, Surviving Mold and Mold Warriors, he dives deep into the information on toxic buildings and mold. He has countless stories of people who have suffered with misdiagnosed health issues that all relate back to mold exposure. In the guide below, you will learn the steps to take to test your home, yourself, and to recover from mold toxicity. Chapter 1: What Is So Toxic About Mold? What Causes Mold to Become "Toxic"
Is There An Easy Way to Know If Your Symptoms Are Caused By Mold Toxicity? If we look into the body, we have millions of microorganisms that make up what we call the "microbiome". In a lot of cases, when the microbiome is discussed, we talk about the bacteria that lives in the gut. However, the microbiome is made of a wide variety of organisms, such as bacteria, fungi, protozoans, and viruses (that are no longer living). While talking about the microbiome can lead us into a big nerdy discussion about the importance of these organisms in the body, we won't focus too much on the details of the microbiome (if you want to learn more, listen to this podcast episode). What I want you to notice about the microbiome is that there is a subgroup known as the mycobiome (the fungal microbiome). When testing is done on the mycobiome, we notice colonies of many different fungi, including the "toxic" kinds such as Stachybotrys, Aspergillus, and Penicillium. If these "toxic" fungi are naturally found in the body of healthy and unhealthy individuals, then why do we consider them to be toxic? When fungus is found outside, there are many species competing for the same space of land. Because the environment is wide open, if one species takes out another species, then another competitor will move in to fight over the space. This helps to keep the relative numbers of each species low. In an enclosed space, such as a house, it is difficult for a variety of species to make their way into the area to compete for space. So if one species has dominated the household, then it will be very difficult for other species to come in and fight because the entire area is enclosed. In small numbers, species such as Stachybotrys, Aspergillus, and Penicillium don't cause too much harm to us. But, if these species thrive in an enclosed space, and we are exposed to these fungi, then that is where the toxic exposure comes from. Fungi release a biotoxin known as mycotoxins that impact our health. We can inhale these mycotoxins, which then gets it into our bloodstream where it spreads through the rest of the body. How these mycotoxins react in the body is dependent upon our genes, exposure level, immune health, stress levels, and many other factors. Since everyone has a different reaction to mold exposure, the symptoms can vary greatly. In fact, mold exposure has been misdiagnosed for so long because many of the symptoms mimic other illnesses, from the common cold to autoimmune issues such as fibromyalgia. While the list below has a lot of the common signs and symptoms associated with mold toxicity, this is not all of the possible symptoms. Mold, like many other illnesses, causes an inflammatory response in the body. It causes an assault on the immune system which is why symptoms can be dramatic. For some people, they can develop minor symptoms such as a cough, where as others it can completely wreck their immune system, causing chronic inflammatory response syndrome, and cause them to barely be able to function. I would love to give you a definitive answer to this question, but assuming a symptom is caused by a specific disease can lead to treating the wrong root cause, therefore delaying your ability to heal properly. And honestly it can cause more harm than good if you are blindly chasing symptoms. That being said, when I ask people in my clinic if they have ever been exposed to mold, the usual response is "no". This is where as a practitioner we have to dig deeper than the initial responses we receive from the person in front of us. Mold doesn't have to be in plain site in order to cause damage, and in a lot of cases it is actually behind walls. Mold toxicity usually comes from mold exposure within a building that we live or work in. These buildings can become toxic due to water damage of any kind, and not getting dried within 24 hours. So an obvious question is if there has ever been water damage to your house. This could be from a burst pipe, a leaking roof, windows that aren't sealed fully, or a variety of other reasons. The next question comes down to the place you work at. For the majority of us, we know if there has been damage to our homes. But our work spaces are a completely different story. We will talk more about testing your environment in Chapter 4. We will be going into each step in more detail in the following chapters. Why have I broken mold recovery into 3 steps? Because each step is vital to determine if mold is the main issue, or if you might have other problems that are influencing your health at the same time. I chose the first step because no matter what you are sick from, living or spending time in an environment that is toxic from mold will not improve your health. If your living spaces aren't cleaned out of mold, then it is extremely difficult, if not impossible, to fully recover from mold exposure. The second step is to determine if the health issue is mold or fungus related, or if the mycotoxin exposure caused potential other illnesses such as lyme to thrive in your body. If we only chase symptoms and don't look for root causes, then the path to recovery can take much longer than is needed. The third step can only happen once you determine what it is your body is fighting off. It is in this step where a protocol is developed to give you your health and freedom back! The first step to recovery from mold exposure is to reduce the mold impact in the environments you are in the most. Buildings are breeding grounds for toxic molds. This is because in an enclosed space, there are only a few species of bacteria and fungus competing for the same amount of real estate. In the outside world, there are thousands of species competing for space in an open area. This keeps the size of the colonies down, and it is hard for one set species to thrive and take over. Inside a building, you don't often get new species that makes its way indoors to fight the species that are already thriving. And once a species gains control of the space, it is hard for other species to come in and win the war. The problem with mold is that it doesn't take much for it to grow. It needs a couple specific parameters to happen first, then it can thrive. First, it needs moisture. This can come from any kind of water damage or even humidity in the air. In fact, the humidity only needs to be at 50% for mold to start growing. So even if you never have water damage in your home, if you live in a high humidity area (such as Florida) then mold can still find a way to grow. Next, mold needs time to grow. It can take as little as 24 hours for mold to start growing once the moisture content is high enough. This is why it is vital to keep the humidity down inside your home, or to quickly dry out an area where water damage has occurred. To keep humidity levels down, we use a large dehumidifier. Depending on your size of living space, I wouldn't recommend any dehumidifier under 30 pints. Most of the small ones don't pull enough moisture out of the air. In fact, we used to use a small one, and it would fill up every couple of days. Then we upgraded to a 50 pint dehumidifier, and that thing would fill up a couple times per day! That is when we realized the small ones don't have the strength to reduce the humidity very much. Plus the larger ones have more controls so you can set your humidity levels. We keep ours right around 40%. Both tests follow the same principles for testing. Dust samples are taken from around the house, and sent to a lab for testing. The difference between the two tests is that the ERMI tests for 36 different species of mold, while HERTSMI only tests for the 5 more common species of mold. This also makes the HERTSMI test a little cheaper than the ERMI. When you look at the pricing of the tests, it doesn't seem to terrible (between $150-$300). But it is recommended that you use new tests for each area within the house so you know the location that sample was taken from. Depending on the size of your home, this can start to get expensive. When you receive your test results, you will notice ratings next to each species of mold and the potential risk to your health. While this is a good start, you do want to take note of any species that pop up that are considered to be on the "low risk" list. Even if these have shown up on your report, they may be causing you more harm than what is shown on paper. If you see these on your ERMI test, than make sure to cross reference these results with the scoring chart found at Surviving Mold. While the ERMI test is a great way to test your home, it does have its limitations. It is only testing the dust particles found in your home. There can be other airborne spores that aren't found in the dust that can cause harm. If your tests results come back positive, then you want to see how bad the condition of the house is. If the scores are near the Moderate level, than you probably want to get rid of anything that is made of cloth or natural fibers. These types of materials mold very quickly and if there is mold in the house, then these fibers usually have trapped mold as well. If your scores come back in the High range, then it is recommended to abandon everything within the house and move immediately. If you are sensitive to mold, then there are 2 recommendations I make to add to your home. The first is a good dehumidifier, which we talked about previously. The second is a filter device called Molekule. This device is used to filter the air of allergens, ranging from mold spores to pollen. While there are many different filters on the market, this one is different. It provides a nanotechnology that instead of just filtering the air, it destroys any molecules of allergens. This works differently than a HEPA filter because with a HEPA filter, there can still be tiny dust particles that are small enough to fit through the filter. Also, filters tend to get moldy as well, especially in commercial buildings or even cars! Molekule is what we use in our own household because of how well we feel with it on. If you want to learn more about the device, we did a podcast episode with the founder of the company. Once you have verified that you may have been exposed to toxic mold, then you want to determine if your health issues is "mold related". This is an important step because mold symptoms look very much like other illnesses, from Lyme Disease to the common cold and flu. Because of that, it is important that you determine for sure what your body is dealing with so you can create the correct protocol. The tests we will walk through are to determine Mold Toxicity. It will not rule out other diseases such as Lyme. This test uses a formula created by Dr. Shoemaker to check if you have any symptoms related to Biotoxin Illness. This test, when administered correctly, can be over 90% accurate for determining mold toxicity. Right now you can try the test out for free HERE. The point of this test is to determine your neurological function after mold exposure. Mycotoxins greatly impact your neurons and can cause you to lose sensitivity in the way you visually see details. This test runs you through a series of images with different levels of contrast, and tests to see if you can see the details. It also is a pretty accurate way to test for exposure to mycotoxins. The VCS test is a pretty inexpensive test that you can do. You can take the quiz HERE. Organic Acids are excreted via the urine, and they are the chemical compounds from metabolic processes. These organic acids can tell us a lot about how the body is breaking down and rebuilds molecules in the body. This test provides a pretty accurate evaluation of the bacteria and yeast in the intestines. It provides a great way to see if there any abnormalities in the body due to exposure to mold. While this test can be expensive, it does provide a pretty clear indicator whether you are suffering from mold toxicity or not. The Mycotox Profile is a newer test that screens specifically for mycotoxin exposure. This test is checking 11 different mycotoxins from 40 different species of mold. The Mycotox Profile is currently the most comprehensive test specifically for mold toxicity. This is one of the main tests we like to use to determine the levels of mycotoxin exposure in someone. Again, this type of testing can get pricey, but the amount of information you receive is worth every penny. The HLA-DR mold genetic test is looking to see if you have the gene to fight off biotoxins. Surprisingly, about 25% of the population does not have this gene, therefore will struggle with biotoxin exposure. While many people use this test as a determining factor for if someone is more prevalent to mold toxicity, it does not provide a definitive answer. For instance, I do have the gene to fight off biotoxins, however I am extremely sensitive to mold. Once you have determined that your symptoms are related to mold toxicity, then it is time to build a treatment protocol. We absolutely recommend finding a practitioner who knows about mold toxicity to help determine the right protocol for you. While the recommendations given below is only recommendations, do not take it as medical advice. Your practitioner will find the right protocol to help you get back to the life you love! 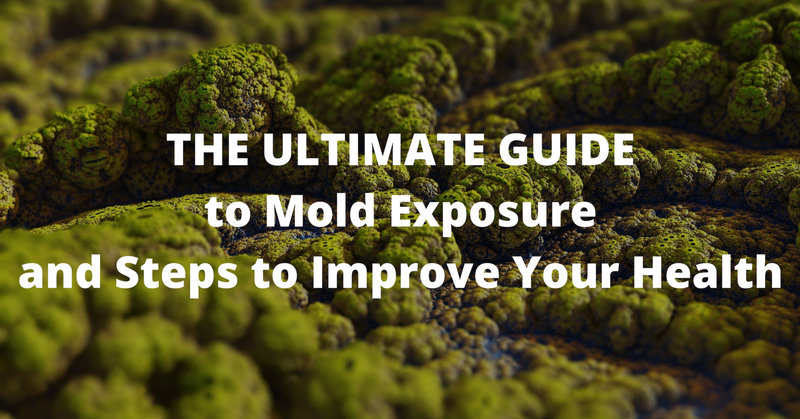 When dealing with mold toxicity and mycotoxins, it puts a lot of burden onto your body. Your detox systems are working hard to get the toxins out of the system, and your immune system is trying to fight off the invaders. Because your body is working so hard, it is best to support your body with a diet that causes the least amount of stress on your system. We recommend using an anti-inflammatory diet to avoid adding in foods that cause inflammation. This means you will want to add in foods containing antioxidants, such as cherries and dark leafy greens, and remove inflammatory foods like dairy, processed foods, gluten, and bad fats. A great way to learn more is to search for a Paleo Anti-Inflammatory Diet. From a food standpoint, this will provide a great start to reducing inflammation and exposure to mold. Your practitioner will help to customize these guidelines for your needs. The following section will need to be adapted for each individual person. This is where the complication of treatment protocols start to begin. To start, whenever there is an inflammatory process happening in the body, we know that there will be inflammation in the gut. This can cause intestinal permeability, or what is known as "leaky gut". Determining whether the leaky gut happened because of the mold, or was there before mold exposure is a non issue at this time. What we know is that removing toxins out of the body requires them to move through the GI tract. This means the GI tract needs support regardless of any other precursors to get these toxins out of the body. It is important to have the nutrients to support the mucosal lining of the GI tract while on a mold protocol. This just protects the rest of the body from any toxins that are making their way out of your system. The liver is your main organ for detoxification in the body. When you are exposed to mold toxicity, then the liver has to try and process all of the mycotoxins and remove them from the body. Since we live in a world full of chemicals and other toxins our body has a hard time detoxing, the liver is constantly being overworked and under-nourished. It is extremely important to provide the nutrients necessary to keep this organ functioning. Sulfur rich foods are typically animal-based meat products. However, you can also get sulfur from cruciferous vegetables. While this is generally thought of to come from citrus fruits, we want to avoid too much sugar when dealing with mold. Therefore, stick to other forms of Vitamin C such as rose hips, amla powder, some herbs, and vegetables. You can get these from grassfed animal meats, organ meats, and some nuts. Again, nuts can contain mold, so be careful. All are rich in glutathione, which can be great to add into your diet. The only problem is your digestive system will break down the glutathione, then will possibly remake it. Glutathione tends to get broken down in the digestive system, and then your body uses those nutrients as needed. It could be to make glutathione, or those nutrients can go elsewhere. This is why I like to take liposomal glutathione. It gets into your system easier because it doesn't get broken down. There are also glutathione IVs which I have not played with, but have heard good things about. There are a couple trains of thoughts when it comes to using binders in a mold protocol. Binders are typically used to grab onto the toxic molecules, and help guide it out of the body. These binders can be bentonite clay or zeolite. Some research shows that binders aren't that effective in grabbing the toxins, and can in fact constipate someone, which is the last thing we want when moving toxins in the body. Other research shows that the binders do in fact grab the toxins and safely transports them out of the body. I like to use binders, as long as it doesn't constipate the person. Oxidative stress is an imbalance of free radicals in the body. These free radicals float in the body and can cause damage to your cells. While antioxidants work well in removing oxidative stress, the extra load of mold toxicity can require more nutrients to remove the free radicals. PC is a nutrient I was recently introduced to for mold toxicity. It helps to pull biotoxins out of the cells, therefore is really great for issues related to mold. This is pretty amazing considering many of the uses for PC are areas of the body that needs support during mold detoxification! There are herbal support as well to help fight off mold toxicity. While we won't get too detailed about herbs for this section, there are some products out there that are extremely powerful and must be used in conjunction with a practitioner. The product we use, called Fung-Gone (only available here at Summit or in New Zealand), is loaded with 13 powerful anti-fungal herbs. The tincture is so potent, that most people can only handle 1-2 drops per day for detox purposes. The tincture forces the body to start flushing out these mycotoxins. Because of how powerful it is, it is not for sale to the general public. While there are many of us who have suffered or are suffering from mold toxicity, we are learning better and better ways for faster recovery. It is important to follow the 3-step approach to healing from mold exposure. Each step will help you to get away from the toxic mold, and to get it out of your system. I would love to hear from you about your experiences with mold. What was your symptoms like, and what did you find was the best way for recovery? Answer in the comments below!